Western blot analysis of extracts from A-204 and SK-MEL-28 cells using COL11A1 Antibody (upper) and β-Actin (D6A8) Rabbit mAb #8457 (lower). As expected, SK-MEL-28 has negative or very low expression of COL11A1. 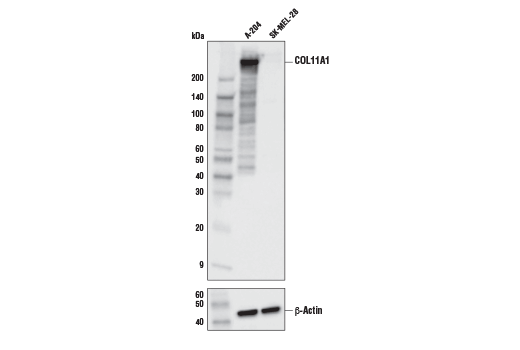 COL11A1 Antibody recognizes endogenous levels of total COL11A1 protein. Polyclonal antibodies are produced by immunizing animals with a synthetic peptide corresponding to residues surrounding Glu320 of human COL11A1 protein. Antibodies are purified by protein A and peptide affinity chromatography. The Extracellular Matrix (ECM) is a complex network of macromolecules that provides structural tissue support to cells in the basement membrane and interstitial matrix. It is composed of many molecules including proteins, glycoproteins, proteoglycans, and polysaccharides (1,2). One of the major proteins that comprises the ECM, and the human body, is collagen. Collagens are a large family of proteins. They are trimeric molecules comprised of three alpha polypeptide chains that form a triple helix structure that is characteristic of all collagens (3). The large family of collagens is divided into three sub groups: the fibrillar collagens, the non-fibril forming collagens, and the fibril-associated collagens. These sub groups differ in their structure and supramolecular assembly (3). Collagen11A1 (COL11A1) is a minor fibrillar collagen that is not normally expressed at high levels in most normal tissues with the exception of cartilage where it is expressed in high levels, and some other tissues/ organs, where it is expressed at a lower level (4). However, it has been reported that the expression of this molecule is correlated with advanced tumorigenic disease through meta analysis of data from multiple cancers, including ovarian, colon, breast, and lung (5). Additionally, it has also been associated with epithelial-mesenchymal transition (EMT) and metastasis (6,7). Cancer associated fibroblasts (CAFs) are typically the most abundant cell type in the stroma of many solid tumors. They are thought to contribute to ECM stiffness, which is ultimately thought to contribute to tumor growth and resistance to chemotherapeutic intervention. COL11A1 has been found to be elevated in CAFs and may contribute to chemotherapy resistance (8). Barkan, D. et al. (2010) Eur J Cancer 46, 1181-8. Hynes, R.O. (2009) Science 326, 1216-9. Ricard-Blum, S. (2011) Cold Spring Harb Perspect Biol 3, a004978. Yoshioka, H. et al. (1995) Dev Dyn 204, 41-7. Kim, H. et al. (2010) BMC Med Genomics 3, 51. Cheon, D.J. et al. (2014) Clin Cancer Res 20, 711-23. Fuentes-Martínez, N. et al. (2015) Histol Histopathol 30, 87-93. Sok, J.C. et al. (2013) Br J Cancer 109, 3049-56.